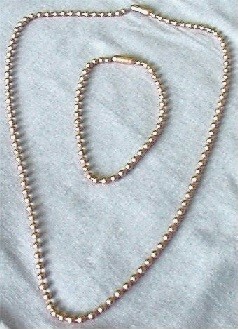 Copper Bead Necklace And Bracelet Set. in Diameter and Completed With 4mm. X 11mm. Hollow Cylindrical Clasps, They are Lightweight, Fashionable, Elegant and Inconspicuous in Their Simple Beauty. Put Them on... And You'll Forget That You're Wearing Them! Around Your Wrist to Create a Multi-Loop Bracelet. the Pull-Switch of a Table Lamp. The Bracelet is Approx. 7 1/4" Long. The Necklace is Approx. 18" Long. Both >br>Pieces are Brand New and Come in a Gift Box.